Charter Communications’ new headquarters won’t be the only office building rising in the South End after the Zoning Board this week approved a new complex for the other side of the neighborhood. The approval of a new media village campus on Canal Street — three buildings around an ivy-covered parking garage — highlights two new quirks of the South End building boom: It appears corporate wants to build there instead of moving in elsewhere and several seek historic buildings instead of new ones. Although the city has a glut of office space with a more than 32 percent vacancy rate for commercial real estate, companies have been pitching new headquarters in the South End instead of open space elsewhere in Stamford. In recent years, three office buildings were approved. And instead of building new, from foundation up as the bulk of large residential builders have done, corporate has instead clamored for a touch of the past, renovating existing buildings — some historic. The largest new HQ is being built just for Charter. But textile designer Caro Home won approvals late last year to renovate an old brick building on Pacific Street, and the leisure company Rhone Apparel already has one nearby. 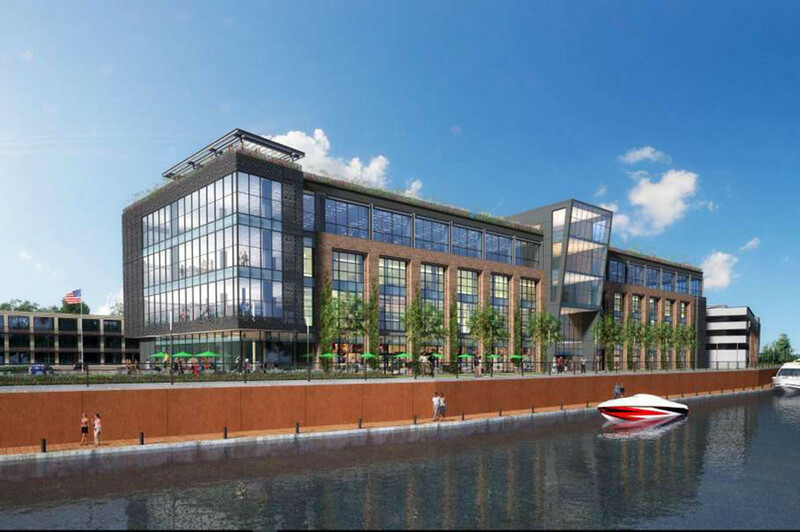 The village, comprising three buildings along the East Branch of Stamford Harbor off Canal Street, will be home to Wheelhouse Entertainment, a digital media company, and have offices for ITV America, a reality-show maker known for producing “Queer Eye” on Netflix, “Pawn Stars” on the History Channel and “Hell’s Kitchen” on Fox. Wheelhouse will move into a 130,000-square-foot office building on 390 Ludlow St., also known as 860 Canal St., where the skeleton of a warehouse now sits. Two additional full stories and partial fifth floor with outdoor seating and a bar will be built above the two-story skeleton. South End neighbors had little issue with the building, some calling it a beautiful structure, but worried the rooftop bar would be too boisterous. The bar, and a first-floor food hall, will be open to the public outside of business hours. “I live adjacent to what I call the screaming whale, it’s the Sign of the Whale,” said Peter Quigley, referencing another South End bar with an accessible rooftop. “I got to tell you, it’s a public nuisance,” he said. The Zoning Board added a condition to police the noise, including a sound-mitigation plan, limiting the noise output and the number of events the rooftop could host with live music every year. Stamford Media Village’s attorney William Hennessey has called the building a trophy thanks in large part to plans to repair a decrepit bulkhead, restore a 15-slip marina and add a public access boardwalk. Some 450 jobs are also tied to the project. The state is supporting the initiative with a $6 million loan to ITV America and a $3 million loan to Wheelhouse Entertainment. Partial loan forgiveness would be possible if certain job targets are met. The building, built around the skeleton of a 1940s warehouse, lies within the South End’s historic district, a 177-acre swath on the National Register of Historic Places. Although it’s in the district, the Historic Preservation Advisory Commission didn’t consider the old building a contributing feature. “Brick facades, large industrial style windows and exposed steel framing elements (are) compatible with the materials, colors and architectural features that characterize the South End Historic District,” wrote Lynn Drobbin, chairwoman of the commission.